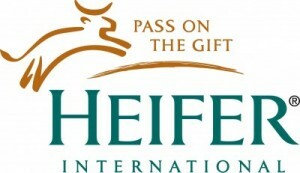 Heifer International’s mission is to work with communities to end hunger and poverty and care for the earth. By giving families a hand-up, not just a hand-out, we empower them to turn lives of hunger and poverty into self-reliance and hope. With gifts of livestock and training, Heifer projects help families improve their nutrition and generate income in sustainable ways. We refer to our animal donations as “living loans” because in exchange for their livestock and training, families agree to give one of its animal’s offspring to another family in need. It’s called Passing on the Gift – a corner-stone of our mission that creates an ever-expanding network of hope and peace. 1. PRAY for all those around the world who do not have access to quality nutrition and education. Pray for those who struggle to earn enough money to provide for them-selves and their families. 2. LEARN: Visit Heifer.org to read stories about people who have been helped by Heifer and learn more about how Heifer operates. Cash or Check: Make checks payable to WGCC and write “Heifer” in the memo line.